This easy Queso Dip recipe is perfect for football parties, as well as just about any party or gathering. The recipe makes a nice big batch of queso and is easy to reheat or keep warm too. Grab some chips and let the dipping festivities commence! 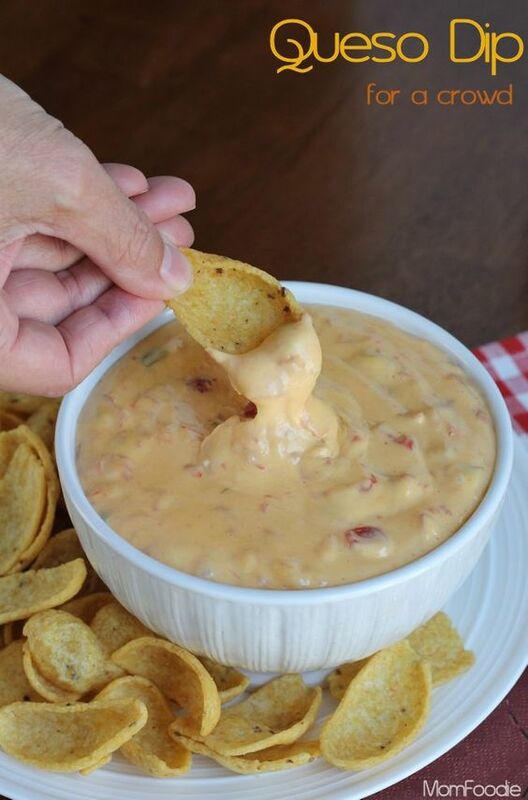 Queso dip is one of the best party dips you can make and it’s oh so easy to prepare. As I mentioned above this easy queso recipe makes a pretty large batch of the cheese dip and if you should need more, preparation is simple and quick. This queso dip is also a very versatile recipe. Not only is it perfect for dipping chips into, it is a great accompaniment to many appetizers, such as potato skins and taquitos, as well. Any queso leftover after the party can be used in skillet meals or casseroles, among a host of other scrumptious practical options. Imagine a shaved steak sandwich slathered in this tex-mex cheese sauce…YUM. 32 oz. block of Velveeta. Put the Diced Tomatoes and Green Chilis in a saucepan over medium heat. Chop the Velveeta cheese into cubes and add to the pan. Stir until melted. Serve the queso dip with chips. 0 Response to "Easy Queso Dip Recipe"